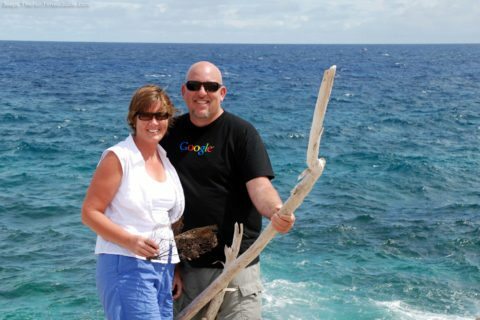 they We were fortunate to go on vacation in Aruba with friends in November. UPDATE: We went again, 6 years later — in December. See details at the end of this post. 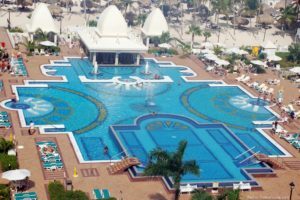 Here are over 6,000 reviews of the RIU Palace hotel & resort. 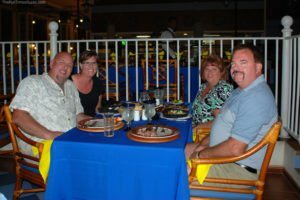 We went on these 2 trips to Aruba with different friends each time. 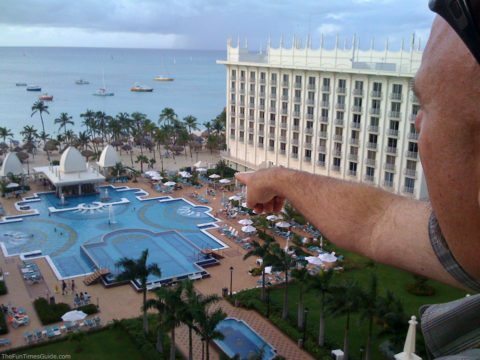 One thing’s for sure… after staying at my first all-inclusive resort in Aruba, I’m 100% convinced that I would choose an all-inclusive resort over an all-inclusive cruise — if given the option again. 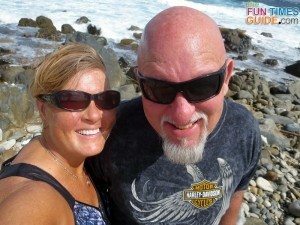 We enjoyed the “all-inclusive” things on our trips to Aruba that much! What’s Good To Drink In Aruba? The free drinks are so plentiful that you never tire of drinking the same thing twice. That said, Jim and I each found our “favorites” and we stuck to those most of the trip. These days, if someone simply mentions one of the ingredients, our mouths water! This is an Island favorite — served by bartenders all over Aruba. The Coco Rosa appears to have been concocted by the bartenders at the RIU Palace Hotel & Resort in Aruba. 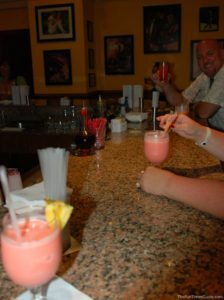 Check out this list of Aruba cocktails and the Riu Palace list of cocktails… Yum! What About The Money In Aruba? 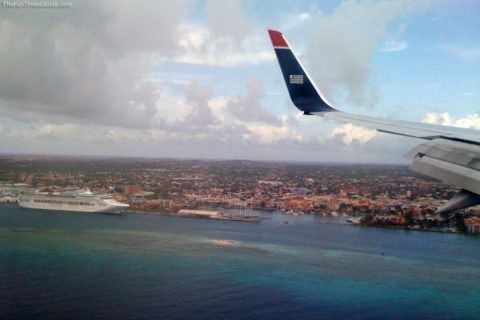 You may be inclined to convert your U.S. money over to Aruban money (Florins) as soon as you hit the ground after your flight to Aruba — BUT DON’T! We did, and we found it nearly impossible to spend their Aruban money anywhere. No joke. They prefer U.S. money, and they all have the conversion rates in their heads when dealing with tourists. Everyone from Aruba that we asked said that 99% of the tourists simply use their own money, rather than converting it to Aruban money. This surprised us. But then again, we don’t get out of the country much — perhaps this is standard in tourist areas worldwide. Jim sat at the blackjack table at the casino in our hotel. He gave them his $700 worth of Aruban money, and they gave him the U.S. dollar equivalent in chips. Jim played for a few minutes, and then cashed out. Wa-lah, we were back in possession of our U.S. dollars once more! 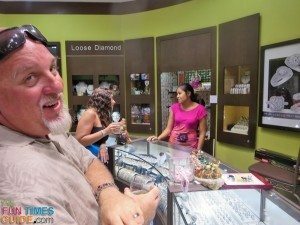 What About Using Debit And Credit Cards In Aruba? Credit cards are accepted everywhere in Aruba, without hesitation. But everyone we dealt with specifically asked for Visa or Mastercard. They were very reluctant to take American Express. We also used the ATM machine located in our hotel twice. Not only did the machine charge us on the spot (just a couple of dollars each time), but our own bank also charged us some crazy amount for those transactions (something close to $10 each, if I recall correctly). We rented jet-skis one afternoon for $50/hr per person (eek!). The price was a tad higher because we utilized the services of a local boat cabbie who picks you up at your hotel’s beach, drives you (via boat) to the part of the island where their jet-skis are located, and then boats you back to your hotel. The fast boat ride there & back was actually half the fun! My most memorable water fun adventure in Aruba was the deep sea fishing trip that we did on our second-to-last day there. 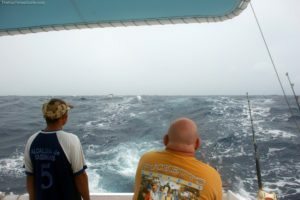 The morning of our afternoon deep sea fishing trip, the skies were dark and rainy — and it seemed the sun would never shine. We ventured onboard the boat (“Lucky Star”), with rain slapping us in the face and the boat rocking to and fro from the waves. As we got into deeper water, the captain sped up even faster — thinking we actually liked all the wave jumping! Perhaps most tourists do, but we didn’t really. They didn’t speak English, so it was hard to communicate to them that we weren’t especially enjoying it. About 30 minutes into the trip, I asked where the best place would be “should I get sick or something”. Within moments, those 2 Dramamine pills had worked their way up — along with all of the breakfast I’d enjoyed from the morning’s buffet. I must’ve created a lot of chum for the fish, because immediately after I got sick, Jim’s fishing line started whirring at fast speed — he had a huge fish on the line! 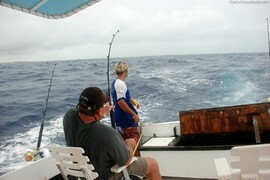 So I kept busy creating more chum, then applauding and photographing his fine catch, then adding more chum, and so on. Even though I’d feel fine for 10 minutes at a time, I eventually got the dry heaves, and no vision of the horizon could calm my stomach. Each time I thought I felt fine, it turned out I didn’t. Unfortunately, after Jim caught his big fish, he started creating his own chum. At this point, the non-English speaking first mate starts hosing both of us down with salt water (from the hose that’s typically used to wash the blood from fish off the boat). He was trying to keep us cool, otherwise, we’d become dehydrated and overheat. But it was slightly annoying — especially since I had my $1,000 camera around my neck! Next in the fast-paced stream of activity onboard the boat… our buddy Terry caught a humongous fish! It was a few pounds heavier than Jim’s, and just as exciting to watch him reel in. We motored on back to the hotel, much slower and with much less wave-jumping action than we had ventured out on. All in all, it was a great adventure! And I was fine as soon as we hit dry land. We ended up forfeiting 3 of our 4-hour deep sea trip (that we pre-paid for!). But the smiles returned to everyone’s faces once we stepped food on dry land and we went on with our day. 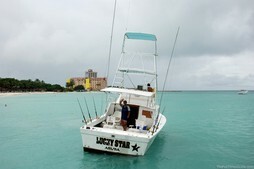 In case you’re wondering, the Lucky Star was something like a 30-foot boat, and in the middle of the ocean we were tearing up the incredibly high seas (along with wind & rain). It looks extremely calm in the photo below because it was — close to shore. The hotel beach where they picked us up and dropped us of was in a little inlet. 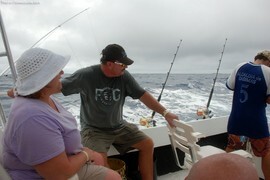 Oh, and the fish the guys caught were 5-foot Wahoo in the 70-pound range. Here’s a video showing 6 to 8 foot seas. We had every bit of that… and more! Most of the time, they said we were experiencing closer to 10 foot seas or 20 foot seas. Plus, it was incredibly windy and rainy on this day. Two hours later, we all went in town and bought lots of jewelry! Aruba is only 19 miles long and 6 miles wide — for a total of 70 square miles. The entire Island can be seen in one full day by car. 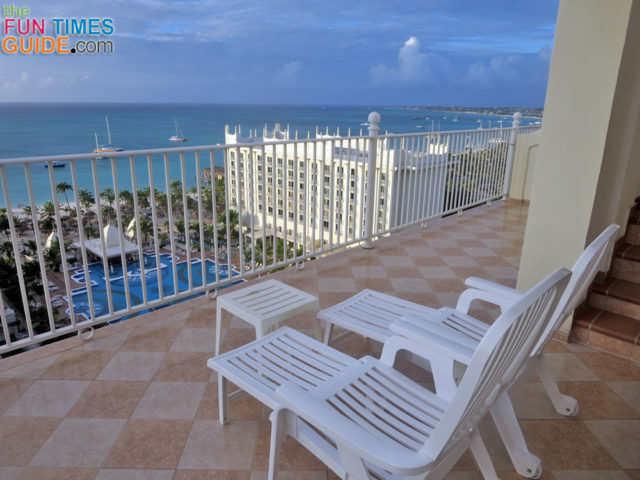 The RIU Palace Hotel & Resort (like most of the major hotels in Aruba) is located 2-1/2 miles from “downtown” and 6 miles from the airport — at the small but “touristy” north (or west) end of the Island. All of the cab fares are pre-set by the Aruban government. They don’t use cab fare meters. Interestingly, they don’t post the rates in public — but the cabbies will show you the cab fare rates, if you ask. The first thing we learned: Aruba is “One Happy Island, Mon.” Just ask our cab driver, whose name was Honey. He said there’s not much else to do around here but be happy and enjoy the alcohol! In addition to all the shops, stores, and flea market booths that are located downtown (which is barely more than a roundabout or two), there is a much more upscale and touristy shopping district located at the northwest end of the island. It was within walking distance of our hotel. Everywhere we went, we felt incredibly safe — even in some of the less-touristy areas, where the locals lived. (We had a 4-wheel-drive Jeep, so we went everywhere!) The Aruban people do not invest a lot of money in their homes and vehicles, that’s for sure. Their priorities are obviously elsewhere. But, as the Island motto states, everyone in Aruba is HAPPY. Our first visit to Aruba was 2 years after the Natalee Holloway case — so it was definitely on our mind, and we talked about it amongst ourselves a couple of times. But there were no signs that it was still being talked about in November 2008 when we were there. Perhaps that was the reason everyone acted so “happy” — to overcome any pre-existing impressions that tourists might have had. We actually went to the movie theater on 2 different nights. We were surprised to see the exact same movies playing in Aruba that were in the States that week. Though the selection wasn’t as plentiful, movies were something fun to do at night in Aruba. After we’d filled up on food & drinks all day long at the beach and the hotel, a quite & calm night at the movies was a good change of pace. Definitely rent a Jeep! 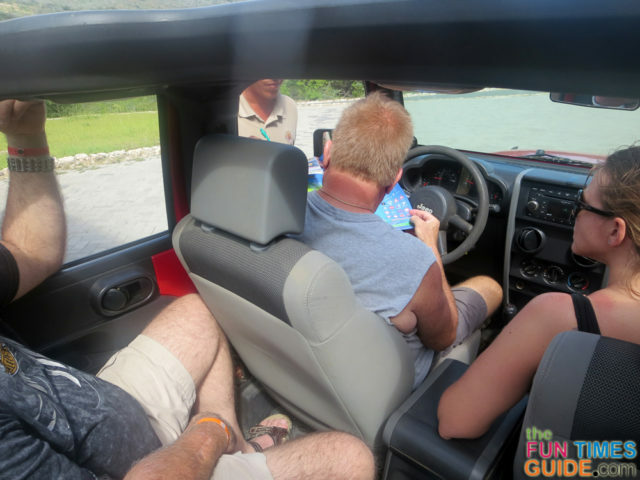 Even considering all the wackiness that took place on our Aruban Jeep adventure, we think a Jeep is the best way to see the Island — on your own. It was one of the most fun things we did while there. Just make sure you know how to read traffic signs in Aruba. 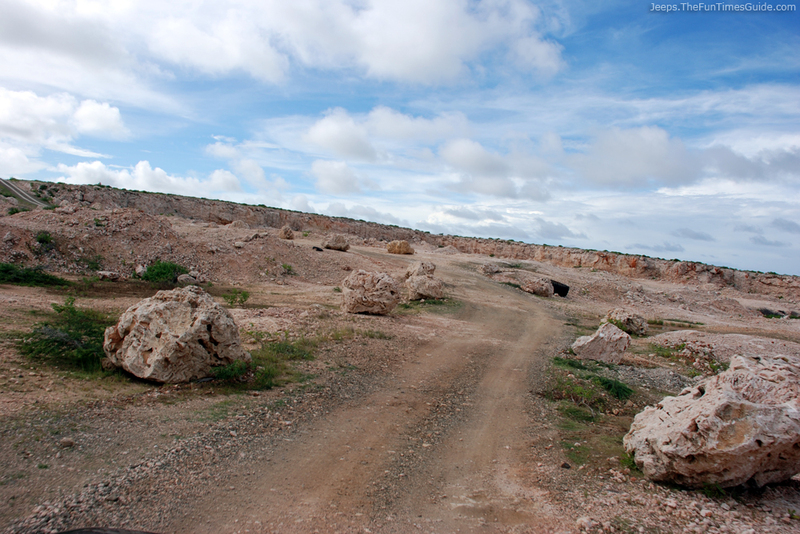 Here are photos from our day spent Jeeping around Aruba. The island of Aruba is also known as the Caribbean Desert — that was one of the biggest surprises to us. Yep, there is dry desert land practically everywhere you look (that isn’t filled with beautiful blue ocean water). This “desert” theme most came into play on our Jeep ride. The short version: we ventured to a lot of cool places offroad, saw a lot of interesting wildlife roaming free, explored some caves, unique rock formations, and beaches. Oh, and we got a flat tire. Aruba has lots of beaches, but you rarely feel inclined to leave the luxurious beach at your hotel. Besides, most of the other beaches are pretty far off the beaten path — and it’s tricky to understand the directions to get there. Even though the weather is generally nice year round, we were there during the “rainy season” (November). And while it did rain toward the end of our trip, thankfully, we got in most of our outdoor activities earlier in the week when it wasn’t raining. When it rains in Aruba… it POURS! There was flooding like crazy on all of the side streets the last few days we were there. The night after my deep-sea fishing adventure, somehow I managed to get sick (a different kind of sick, trust me) at a meat-eater’s paradise kind of restaurant called Texas de Brazil. It’s a popular chain in the States. They continually bring out thick hot & juicy pieces of fresh cooked beef, pork, and lamb all night long and you get to tell them Yes or No — you want them to slice you off another piece… or not. It’s all-you-can-eat, and even if you’re saying No, your tablemates are often saying Yes. So there is constantly someone at your table slicing meat — and it’s almost as if they’re encouraging you to eat more, More, MORE! We tried a bunch of different restaurants in Aruba. 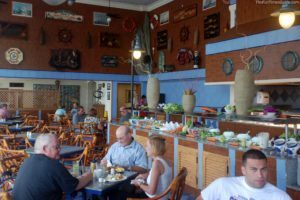 According to reviews from other diners, these are the best Aruba restaurants. And from another list, we went to #9 El Gaucho and definitely enjoyed it. The mariachi band there takes requests. They played a sweeeeet rendition of Van Morrison’s Brown Eyed Girl and rocked out Led Zeppelin’s Stairway to Heaven! I learned a valuable lesson about what to pack on a trip to Aruba. I so wish I’d left all that other stuff at home. That way, I would’ve had more room to bring back souvenirs! I will definitely pack much lighter on our next trip there. Oh, and this is kinda trivial, but I’m so glad that I got a short wash & go style haircut right before we left. Because you’re always on the go when you’re on a beachy vacation. And no one really cares what you look like. Everyone goes out looking a little less made-up than they would normally. A carefree hairstyle enables you to be more spontaneous, without having to spend time “getting ready” when there are so many fun things to do — day and night. Another thing I did was to visit the tanning booth a few times before going to Aruba. I never burned on this vacation, and I actually left with a really nice tan! Everyone else I was with got sunburned by the time we left Aruba. Since this trip, we have decided to make all-inclusive vacations a regular thing that we do with friends. Every few years, we’ll choose a different vacation destination. Fun, fun, FUN! We all agree that we would definitely like to stay at a RIU hotel & resort again in the future, but may choose a different location — just for something different. UPDATE: Yep, We Did It Again! We went back to Aruba for a second time — 6 years later. This time it was the first week of December. We arrived on a Sunday afternoon and left on Friday afternoon. That’s 4 full days of fun, and 2 half days. Since we’d been there before, 4 days was plenty of time to see and do everything this time. We rented a Jeep again — from a different place than before. 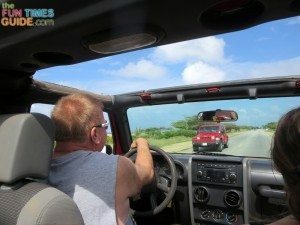 What we learned: No matter where you get your Jeep rental from in Aruba, there will be “issues”. For example, the first time, we had a rickety old Jeep and ended up getting a flat tire while we were out having fun. This time, we had a newer Jeep that barely had enough power to go up hills or long distances without constantly pumping the gas pedal — and then the battery was stolen out of it while parked in the hotel garage parking lot where they said to park it. We were told that we had to file a police report in order to protect ourselves — so we did. Clearly, in Aruba the Jeep rentals are all beat up and worn out. But that’s okay — I guess. If we did it again, we’d only rent for 1 full day, instead of keeping it overnight. The food and drink seems to have gone downhill a little bit from the last time we were at the Riu Palace. This may have something to do with the fact that they’re preparing for a major renovation soon. So perhaps they’re just not be putting a lot of effort into what they’re doing — and serving — right now. For example, the cheesecake didn’t taste like cheesecake. Beef didn’t taste like beef. Bread items didn’t taste like bread… or flour. Tomato sauce was practically non-existent (in pastas, on pizzas, etc). Milk shakes were made with powder. (I actually liked the strawberry/banana shake a lot though!) The only eggs that were real were the ones cooked “over easy.” We ate out twice: El Gaucho (which was awesome) and Gianni’s, (which was also great). The alcoholic drinks were plentiful (and free), but we actually didn’t drink much at the hotel this time — because they were all made way too sweet. We were told that this is mostly due to the juices that are used when making fruity drinks in Aruba. We learned a little trick though — ask for a double shot of alcohol in each drink. That way, there’s less sweetness in each sip. It helped a lot. My drink of choice this time: Aruba Ariba. Jim’s favorite: Screwdriver. And our friends’ faves: Rum Punch. Jim and I each had a really rough time with diarrhea (and some vomiting) this time. Thankfully, the gift shop at the Riu Palace sells Imodium — even though the concierge desk at the hotel won’t admit that, because they don’t like offering “medicine” on the premises which could affect your overall health. (They actually wanted me to take a cab ride to the local pharmacy instead of waiting 10 minutes for the gift shop to open!) The gift shop sells Imodium in small portions, rather than selling the entire box as we’re used to in the U.S. They break up the blister packs into 6-pack sections — which is the maximum you can take in a 24-hour period. Since Jim and I were both dealing with it at different times, I ended up going back a second time to buy another 6-pack. And then a third time before we flew home — just to be sure I’d have something in case of an emergency. For the record, their supply of Imodium was dramatically decreasing each day. So it was obvious that we weren’t the only ones in the Riu hotel dealing with this issue. One thing we noticed this time that wasn’t so obvious last time: lots of families with kids were vacationing at the Riu Palace. There were so many very young children and kids in strollers this time — at the pool and in the restaurants. Aruba must be a kid-friendly place to vacation. 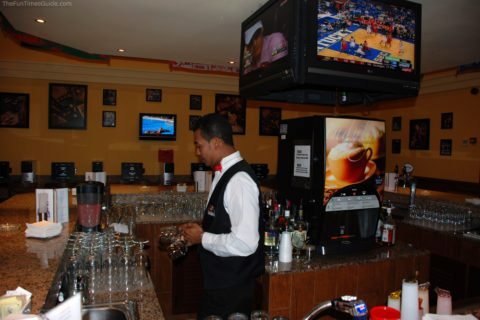 The sports bar inside the Riu Palace was our favorite indoor hangout spot. Whenever we weren’t hanging out at the poolside bar, we were inside at this bar (or winning money at the casino). The best things about this bar: the workers are the friendliest (and chattiest) here. They always have sports playing on the 4 TVs. There’s food available 24/7 in the refrigerated coolers and on the counters — including sandwiches, fruit, nachos, popcorn, hot dogs, muffins, and croissants. I’m not sure what we did last time, but this time we debated about leaving tips everywhere we went inside the hotel. So we looked up the hotel’s website to see what was expected. It says, “All accommodation, taxes and tips included.” So we only left a tip if a server was uniquely helpful or went out of their way for us in some way. One thing that made me feel better about doing this was the response I got when I asked a server if they treated her well here. She smiled real big and said “Yes!” I cannot complain about the salary they give us.” It’s clear that 95% of the servers at Riu Palace are very happy, and they strive to be very helpful. I even recognized a few familiar faces from our visit 6 years earlier — it’s a good sign to see happy (and long-term) employees! If you’re going to the Arikok National Park in Aruba, here’s a little tip before you pay the $10 per person fee to drive through the National Park. (They started charging admission 3 years ago. Children under age 17 are free.) If you tell them you’re just going to the Boca Prins restaurant (located by the windmills inside the park), you don’t have to pay the admission fee! The folks working at the restaurant told us this. Unfortunately, we didn’t know this before we had already paid our $40 park admission fee. In case you’re wondering if the $10 fee is worth it or not, I’d say yes — only because there’s not a whole heck of a lot to do on the Island otherwise. The natural pools and rock formations (as well as the loud crashing ocean waves) are quite beautiful to see all throughout the park. Psst… before you exit the park, there’s a place where you can drive up to the very top of a mountain and see a panoramic view of the entire island of Aruba! Boca Prins is a great little restaurant and bar inside the National Park — you really should go there. The wings were great! The beer hit the spot after a long day of Jeeping. And their funny little claim to fame is the fact that they have terra cotta cup holders to keep your beverages from blowing over — because it’s incredibly windy there. (Which is why you see all the windmills right next to the restaurant.) For what it’s worth, the restaurant requests $1 in the tip jar for using the restroom. It covers the cost of the water — which is in short supply on this part of the island. 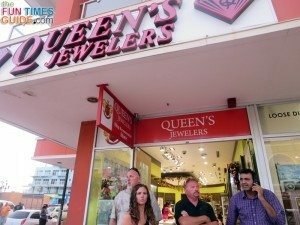 If you’re in the market for some jewelry while in Aruba, you’ll find plenty of jewelry stores all over town. 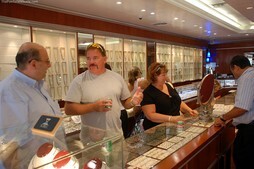 Our favorite is Queen’s Jewelers. The owner is Henry, and through the years he has become a close personal friend — due to the fact that he has been so trustworthy and reliable with our custom jewelry orders. 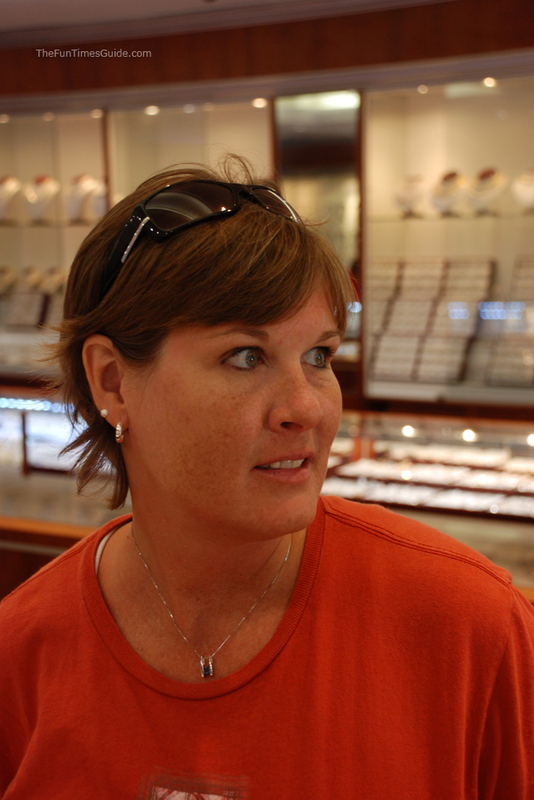 For the past 6 years, we (and the friends who traveled with us) have bought all of our diamond and gold jewelry from Henry at Queen’s Jewelers. (He also has a U.S. store in California.) 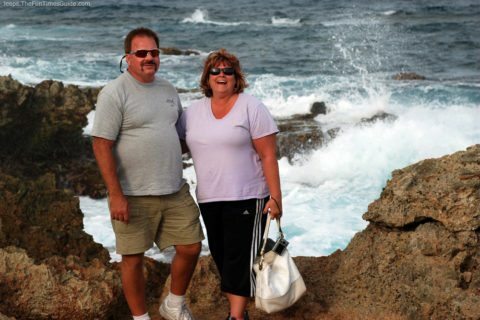 If you happen to stop in while you’re shopping in Aruba, tell him Jim and Lynnette said Hi!